It's Almost Winter: Is Your Pool Ready? Home » Pool Maintenance » It’s Almost Winter: Is Your Pool Ready? The winter brings about plenty of changes; not only do you swap out your summer wardrobe for your winter selection and start preparing for holiday gatherings and parties, but you also must consider how to prepare your backyard pool for incoming cold. Your preparation will ultimately be determined by your geography. Pools in Pennsylvania need to be completely winterized, but pools in Florida require less maintenance. Read through the following information to make sure that you are treating your own pool right this winter. 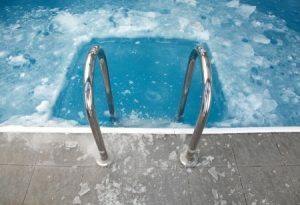 Pools in northern states need to be winterized to be protected from the incoming negative temperatures and snowstorms. This is a rather long process that begins with cleaning the pool, balancing the water chemistry, and then lowering the water level. You then need to drain all pumping, filtering, heating, and chlorinating equipment, lubricate the pump lid, and add winterizing algaecide into the remaining water. Finally, cover the pool, and wait until May do undo all of these measures. If you live in the sunbelt, you are spared from such a drawn out winterizing process. In fact, you can choose whether to close your pool for the season or keep it open for use. Plenty of Florida winters have seen temperatures warm enough for a refreshing swim, so many homeowners choose to keep their options open. The most important elements of maintenance for a southern pool during the winter are continued cleaning, water level monitoring, and algae prevention. Even if you don’t use your pool more than once or twice between December and March, regular cleaning needs to remain a priority in order to ensure debris doesn’t accumulate and cause trouble. The same goes with monitoring your water level. A combination of chillier weather and decreased rainfall can cause the speed of evaporation to increase, which will cause your water level to drop a few inches per week. Add water as needed to prevent this issue. Algae is another concern, so test your water regularly and be sure to keep it circulating. Many areas of Florida are subject to algae bloom even in the winter due to the mild climate. The best circulation during the winter is about 4-6 hours per day. As long as you take these steps, your pool will be healthy and ready for use when spring finally arrives!